My 6 year old became an expert on constructing and the deconstruction of both. 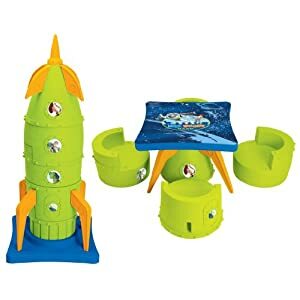 I really had no idea how much fun my kids would have with this toy but they truly love it. They’ve been sitting at the table for snack and making the rocket pretty regularly to for “decoration,” as they’ve put it. It may be a bit pricey at $69.95, but it’s two toys in one and it’s a biggie. Get it for $69.95 on Amazon with free shipping. One word of warning – it comes in a brand box that shows what’s inside! This box arrived via our neighborhood “package guy” as Cole and I were walking inside one day. I had no shot at hiding this away until the holidays. So I’d recommend having it either shipped to Grandma or making sure your kids don’t see your deliveries!